It is that time of year that the farmer's markets are starting to spill over with summer bounty. 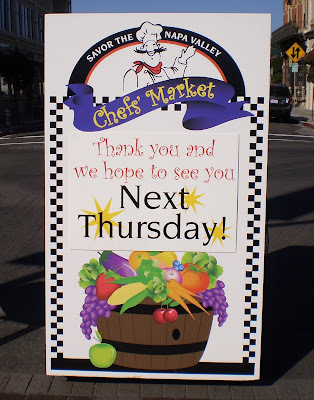 Napa, California has an evening market, called Chef's Market. 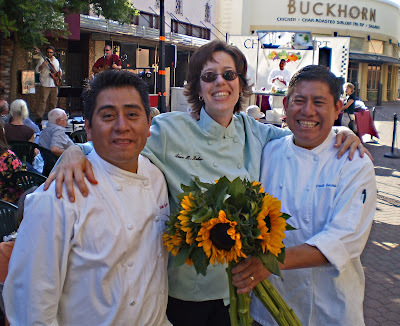 It is a festive affair with live music, wine tasting, and chef's demonstrations. This was one Hot market. I mean that literally. The thermometer was pushing 90 degrees at 5:00 pm. Being a market, in Napa, there must be wine. There were plenty of choices of grape to taste and imbibe.